Jorge Lanata and Nicolás Wiñazki found guilty of spreading false information about a former provincial agriculture minister. Two of Argentina's most high-profile broadcast journalists must now pay $600,000 (US$15,000) in damages, after a court found the pair guilty of spreading false information about a former provincial agriculture minister. 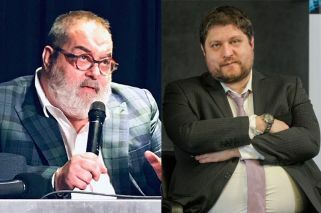 Jorge Lanata and Nicolás Wiñazki were found guilty of defaming former Chubut province Agriculture minister Norberto Yauhar in investigative reports aired on the Periodismo Para Todos programme in 2013, which claimed Yauhar was involved in a drug-trafficking scheme. The ruling applies equally to broadcaster Radio Mitre and production companies Artear and Ozono Producciones. "The news about former Minister Yauhar, his relationship with drug-trafficking and his participation in that spurious business were false", said ruling Civil Court Judge Fernando Pablo Christello, who described the journalists' behaviour as "an imprudent use of the right to inform". Lanata and Wiñazki, who said he would appeal the ruling, will now have to pay damages. The broadcaster and production companies involved in the broadcast will, for their part, have to publish a clarification on their respective websites informing users for at least two days that they have been charged with spreading false information. Yauhar lodged a complaint against the parties after the June 7, 2013 broadcast of an investigative report titled "Narkolandia". In it, Wiñazki and Lanata linked the minister to a drug-trafficking investigation in which police discovered 110 kilos of cocaine inside boxes of prawns from the Poseidón fish company. The company was owned by Omar Cura Segundo, whom Wiñazki signalled out as the alleged "frontman" for Yauhar. However there was no sufficient evidence provided in the report to prove this relationship, according to Judge Christello's ruling. Both Lanata and Wiñazki reiterated the claim on their programmes on Canal 13 and Radio Mitre, assuring audiences that Yauhar "would go to jail because he's a drug-trafficker". In their claim, Yauhar's lawyers said the journalists had "intentionally created, promoted and broadcast a supposed 'investigative report' in which they tied him (Yauhar)... to drug-trafficking, adding the suspicion that the owner of the fish company where the cocaine shipment was found in shrimp box was his frontman". Nicolás Wiñazki told Perfil he would appeal the decision. "This is a first-instance ruling which will be appealed and there are still two more instances", he said. "These things happen in the Judiciary", he added. Jorge Lanata did not comment on the ruling.